With the Easter travel season in full swing and global airport passenger traffic up 6.4% in 2017, airport managers are preparing for another busy year ahead with the support of mobility solutions provider thyssenkrupp. Home to some of the busiest airports in the world - some averaging 40 years of age - the United States is a priority country for airport modernization. As the tourist season gets underway, thyssenkrupp has announced commissions in the double-digit million US dollar range of its innovative mobility solutions in three key US airports in New York and San Francisco. In New York, thyssenkrupp’s services have been commissioned at LaGuardia and John F. Kennedy (JFK) airports – two locations which, combined, transport more than 40 million passengers every year. At JFK Airport, four iwalks have been installed at Terminal 4 Concourse B, which serves Delta Airlines passengers. At LaGuardia Airport, 35 steel passenger boarding bridges will be installed, as part of the Central Terminal Building Replacement Project. This is a seven-phase project that will begin with 11 gates in May 2018 and will be completed in 2022. On the West Coast, thyssenkrupp will install 33 elevators, 20 escalators and four moving walkways at San Francisco International Airport (SFO) as part of the airport’s $2.4 billion renovation of Terminal 1 and Boarding Area B. SFO – the seventh busiest airport in the country which moves 50 million people annually – required all transportation products to meet LEED (Leadership in Energy and Environmental Design) v4 Gold certification standards. Health Product Declarations outlining all materials utilized in each product were also required. The full renovation is expected to be completed by 2022. As competition between airports increases, the ease and efficiency of passenger movement is critical to providing an experience that will keep travelers coming back. 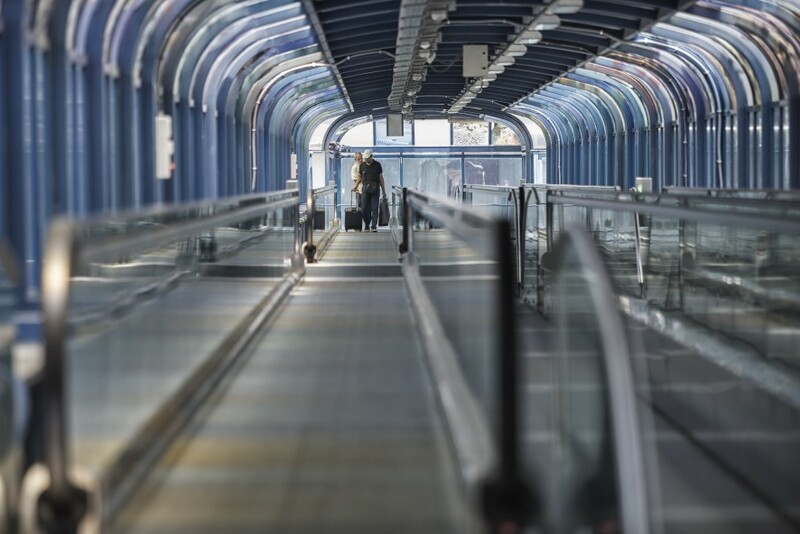 thyssenkrupp’s sophisticated iwalk system offers airport operators an ideal answer to help ease passenger flows in busy airports. The modular, pit-less design means it can be easily installed in existing infrastructure with minimal disruption to airport operators, while ensuring the safe transport of passengers who have to traverse increasingly long distances between gates. The installations range significantly in scale, from the impressive 80-meter iwalks installed in Madrid’s Atocha Train Station, to the seven-meter iwalks recently installed at an Italian supermarket. thyssenkrupp’s innovative docking and gate management solutions. The company is also engaged in a number of expansions, modernization and new installation airport projects globally, including at Istanbul New Airport, which is set to be the largest airport in the world. With its recent acquisition of market leader FMT’s aircraft gate docking systems division, the company has also boosted its intelligent airport solutions capabilities. As passenger numbers are set to double by 2035 to 7.2 billion, integrated intelligent systems are key to significantly improving efficient mobility in airports. Please click here for press images.